MC Group Plc started its jeans business in Thailand under its own Mc brand in 1975 and listed on the Stock Exchange of Thailand last July. Today MC specialises in retail and distribution management of lifestyle products and services for brands under the group as well as other leading brands. 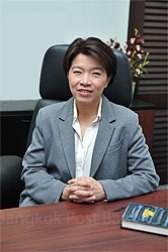 Chief executive Sunee Seripanu discusses the company’s strategy and outlook. What is MC’s business model? Who are MC’s target customers? Twenty years ago, our target customers were generally 15-40 years of age looking to purchase jeans, but now with more brands and product categories, our group of customers is very wide. It is very important to understand what customers’ lifestyles and desires are, which provides us with an understanding of new market trends and how we can adjust our brands’ positioning. MC recently purchased TimeDeco. What was the reason for this and is MC looking for more retail-related acquisitions? Times have changed, and the market has evolved. I have noticed that nowadays there are watch stores on almost every street corner in major shopping districts in the US, Europe and Japan. A watch has become more than just a device to check the time but a style statement conveying a unique personal identity. People today show their character via their fashion — they have an outfit for work, for leisure, for going to the beach, so market demand has changed. We understood from day one with the government policies in 2012 that there would be an impact on consumer spending in 2013. Politics also has made an impact on the business, but it is not that our target groups of customers have a purchasing issue — it has more to do with the mood for shopping. Today when consumers think of jeans there isn’t one brand that immediately comes to mind first, and we see this as an opportunity to further expand our brands’ recognition via marketing, store expansion and perhaps internationally as well. We are also taking the necessary steps today with an IT master plan, a new R&D and design centre and a new distribution centre to ensure MC will be a successful lifestyle retail company. Previous PostWhat happened this week 10/02 – 14/02Next PostOpportunity Days are back!